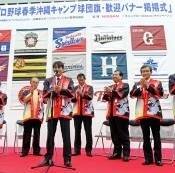 On February 1, professional baseball spring training camps started in Okinawa and Miyazaki prefectures. Twelve baseball teams train throughout the month, aiming to improve prepare for games on March 30, the day that both the Central League and the Pacific League commence. 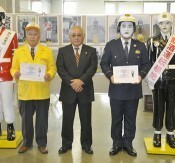 On January 27, at Miyakojima and Tarama, the policeman-style figurine Miyakojima Mamoru-kun who always bears up well in all weather conditions and acts as a lookout for society, and his sister Maruko-chan were registered as special residents of Miyakojima.